Don’t freak out—it’s just a snake. 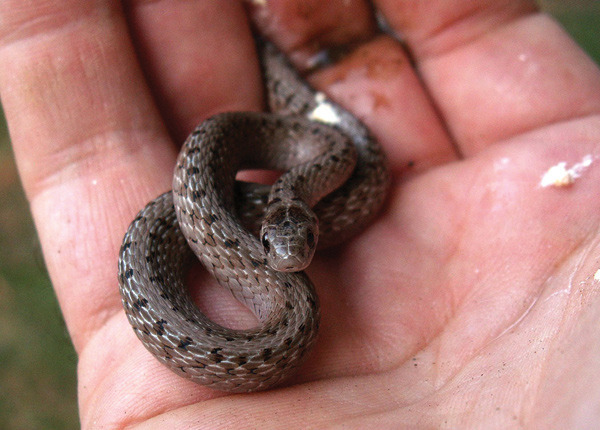 It’s a really tiny snake, totally harmless. The worst it can do is poop on you. Sure, you weren’t expecting to find a real live snake in West Philly (or North Philly, or Northwest Philly), roaming the soul patch of green that passes for your backyard. Worms, yes; slugs, unfortunately, yes; maybe a few other of your standard garden bugs; but a snake? The pencil-sized, beige snake with two rows of little dark spots down the back has a name, the “northern brown snake” (Storeria dekayi for the scientists out there), and, unlike other native snakes in our region, it seems to thrive in cities. No one is quite sure why they do so well around urban greenery—it might be that slugs, their favorite prey, are particularly common in our vacant lots and gardens—but herpetologists have been documenting them in the big cities of the Northeast since the late 1800s. Brown snakes help their cause by staying out of sight, hunting their slimy quarry in thick vegetation and snuggling up under rocks, boards, old lawn furniture or just about any other object that might warm up in the sun. Gardeners find their brown snakes eventually, as do the neighborhood children—two demographics that tend to spend a significant amount of time digging and playing close to the ground. Most other Philadelphians don’t know there’s anything as wild as a snake living behind their rowhouse; indeed, the ophidiophobes would be happier not knowing. There’s probably no snake more harmless than the brown snake. It will puff up a bit to look big and tough, but it’s hard to look threatening at 10 inches long (they’re born at about three inches, and a brown snake longer than 12 is a bruiser). Its teeth aren’t big enough to break human skin, and it packs no venom. Only soft, gooey creatures fear the brown snake, and that, at least, should endear them to the Philadelphian striving to protect flowers and veggies from the slow but ravenous slug hordes. If you have no garden, but would still like to meet a brown snake, start looking in May. They spend their winters huddled together in communal hibernation dens, but by late spring they’ve spread out to hunt, get lucky and have their itty-bitty babies. Search in a community garden or vacant lot, and check under surface objects with a bigger footprint than a piece of office paper. I’ve had luck with everything from railroad ties to discarded clothing. Always do the snake the courtesy of moving it out of the way before you put its roof back down—it will find its way back, and we don’t want anyone to get smooshed.